Since 1948, professionals and consumers have relied on No Rinse Shampoo clean hair when traditional shampooing is difficult or inconvenient. An easy way to shampoo and condition your hair with no water - no mess - no rinsing. The one-piece cap contains a combination of Shampoo and Hair Conditioner leaving your hair fresh and clean and manageable. No Rinse Shampoo Cap is latex free and alcohol free.For a warm, relaxing shampoo, the package can be heated in a microwave prior to use. No Rinse Shampoo Cap is easy to use:Place cap on head, massage hair through shampoo cap until hair feels saturated. Remove cap and discard. Put Cap on, massage hair through cap, remove and towel dry. Provides cleansing, deodorizing and moisturizing leaving skin refreshed and odor free while reducing labor and linen costs when compared to basin bath methods. Easy to use: No water,no rinsing &no towel drying required. Take it Along where ever you go! Superior Clean Up! Feel Clean and Refreshed in Minutes! 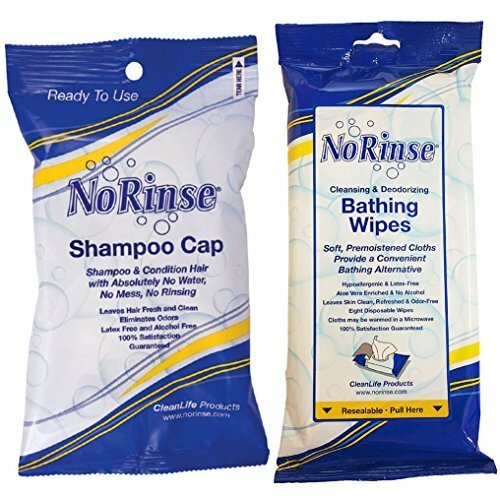 NO RINSE SHAMPOO CAP ~ is an easy way to shampoo and condition your hair with no water - no mess - no rinsing. Easy to use: Place cap on head, massage hair through shampoo cap until hair feels saturated. Remove cap and discard. Thoroughly towel dry, comb and style hair in a normal manner. If you have any questions about this product by Clean Life, contact us by completing and submitting the form below. If you are looking for a specif part number, please include it with your message.